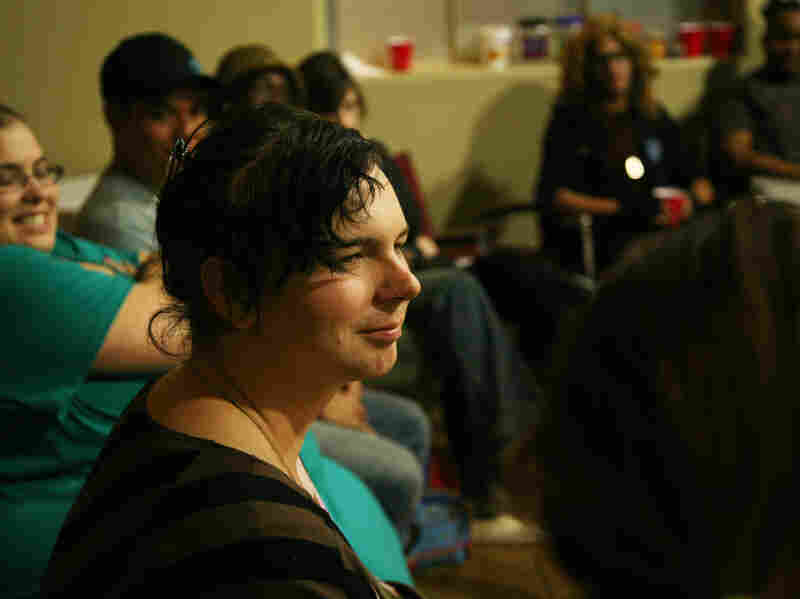 Pastor Redefines 'Church' For Transgender Youth For transgender people, church can feel extremely unwelcoming. A congregation in Phoenix is trying to change that by offering free meals and support to them — many of whom are homeless trans youth. 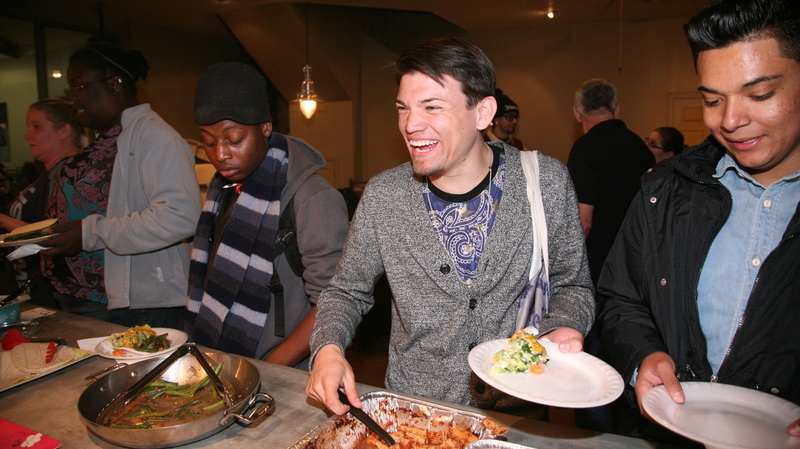 Jesse Valles (from right,) Isaac Apodaca, Lamar Kellam and Sydney Harrison get in line for the free Sunday dinners offered at the Rebel and Divine church, a congregation in Phoenix that aims to help at-risk youth, many of whom are homeless and transgender. "There's no shame. There's no judgment. It's here to help. We're about health and wholeness," says the founding pastor, Jeffrey Dirrim, as he points to countless toilet paper rolls on the table for anyone to take. It was toilet paper week. "And you need toilet paper, we've got toilet paper." There's no shame. There's no judgment. It's here to help. We're about health and wholeness. Katrinna Alexandros says until she started attending, she didn't know she could be friends with Christians. "My whole life, it's just been Christians are the ones who hurt everyone, and here it's not," Alexandros says. She was raised a strict Southern Baptist and a boy in a conservative, religious town in rural Kentucky. At the age of 9, she realized she was trans. Although she never officially told her late mother, she says her mom always knew. But Alexandros felt it was religion that kept her mother from fully embracing who Alexandros was. Now, as a 23-year-old Wiccan, Rebel and Divine is the only church she can imagine herself attending. "There's no other place like it. It is a place that you can be yourself and get help and help others," she says. Katrinna Alexandros was raised in rural Kentucky as a boy and a strict Southern Baptist. Now, as a trans woman and a Wiccan, she says she can't imagine feeling comfortable in a church other than Rebel and Divine. There may not be readings from the Bible or the mention of the name Jesus, but there is a reliable, consistent togetherness. 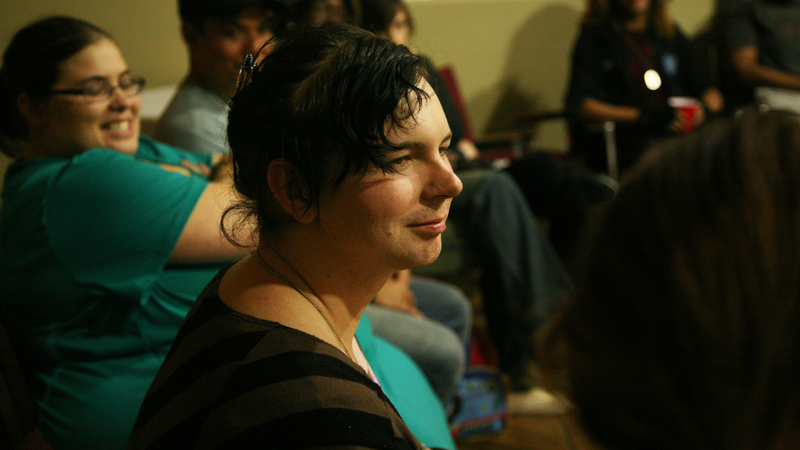 Sydney Harrison doesn't identify as male or female, and uses the pronoun "they." Harrison says Rebel and Divine gives them something in their lives they can always count on. Harrison comes here both for basic supplies like toothpaste and for human connection. "Just coming in and getting hugs from everyone does a big difference for me," Harrison says. The 24-year-old is very connected to their mom, but says many here aren't so lucky. Some of the young people here ran away from home. Others were kicked out. "We're there for each other, and we love each other," Harrison says. "Even as unconventional as we might be or as crazy or as hectic as it might be, we're still family, at the end of the day." Rebel and Divine is a family these young people are choosing and where they support each other. Dirrim hopes they will always feel safe. "Know that you are blessed, that you are loved, and that you are never, ever alone," he says to the attendees after the meal. He reminds them that no matter what, they are worthy. "And if anyone has told you otherwise, they were wrong. You are. And if you question that, come talk to me." With that, the congregation heads out, many of the kids with heaping plates of leftovers. "We broke the bread, we shared the cup tonight. We had community that came together with a family of choice, and we talked about hope and love and joy," Dirrim says. "Many who came in here wounded still walked out of here today with smiles on their faces. And that is church to me. " It's an ancient pattern of Christian worship. People gathered, shared a word of grace, and a meal — and then Dirrim sent them back out into the world, with a blessing.